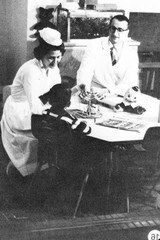 Emil Frei with nurse and child patient. Emil Frei is the former physician-in-chief of the Dana-Farber Cancer Institute. He worked at the National Cancer Institute from 1955 to 1965. In 1972 he received a Lasker Award for his outstanding contribution in application of the concept of combination chemotherapy for lymphoma and acute adult leukemia. Frei was one of the founders of the Acute Leukemia Group B which later evolved into the Cancer and Leukemia Group B (CALGB), one of NCI's national clinical trials cooperative groups.